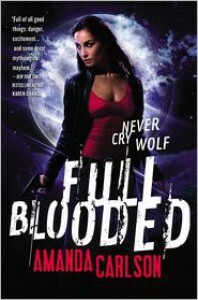 FULL BLOODED was an entertaining debut urban fantasy novel. It was action-packed and fast-paced. I did think that some of the dialog seemed stilted and the author was guilty of being and the tell side of show or tell. Jessica McClain begins the story by shifting into a werewolf for the first time at age 27 -- long after the usual age. Jessica has left the Pack where her father is Alpha and made a life for herself in the human world. She was a police officer for a while but is currently a detective with her partner who is a werefox. She has a human enemy from her time as a police officer. Detective Ray Hart is certain that she is guilty of something and has been harassing her since she left the police.Once she shifts, she finds that she has even more enemies. She is the only female werewolf in the world. Many wolves are certain that her birth is a sign of disaster for the Pack. 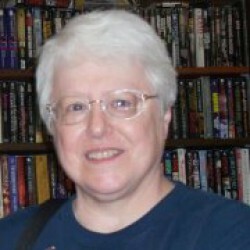 She has also drawn the attention of much of the rest of the supernatural world because of her rarity. The shear number of changes Jessica experiences in this story would rock any character's world but she seems to take each change in stride. She has to deal with becoming a full blooded werewolf, being able to half shift into a Lycan form which had been thought to be only a legend, finding her true mate when very few wolves ever manage that, and finding that her mate isn't another werewolf. Throw in coming to terms and learning to control her wolf and being thrown into the middle of a werewolf war then being kidnapped by a sorceress for a vampire and you have lots of action in this story.This is a story that ends on a cliffhanger. I know I'll be adding HOT BLOODED to my reading stack to find out what happens next for Jessica.